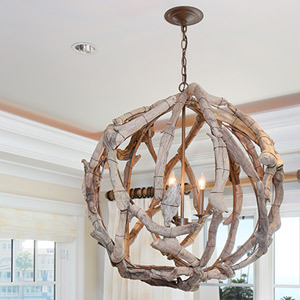 Currey & Company presents a wide selection of bold and imaginative lighting fixtures using the classic natural elements that I love. Hand-forged iron, hand-carved wood, porcelain, brass and turquoise beads (our fave!) are combined in unexpected ways that demand attention. Not to be outdone, their table and chest selections meld the traditional with the contemporary, using rustic materials for that perfect beachy charm.